The Mun Chin live in the mountainous regions of the southern Chin state in western Myanmar (formerly known as Burma). 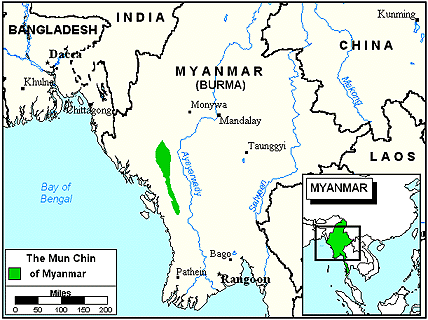 Since the first Burman kingdom in the eleventh century, Myanmar has experienced ethnic division and political unrest. Lacking specific information about the Mun Chin, this profile is based on their relationship to the Daai Chin and draws conclusions from their location around the township of Matupi in Myanmar. The Mun Chin are also known as the Chinbok. This is a derogatory term that means "rotten" in Burmese. One source says that the Mun Chin of the Kanpetlet region refer to themselves as the Cho. The Chin tribes were once referred to as the "wild hill tribes" of Myanmar. 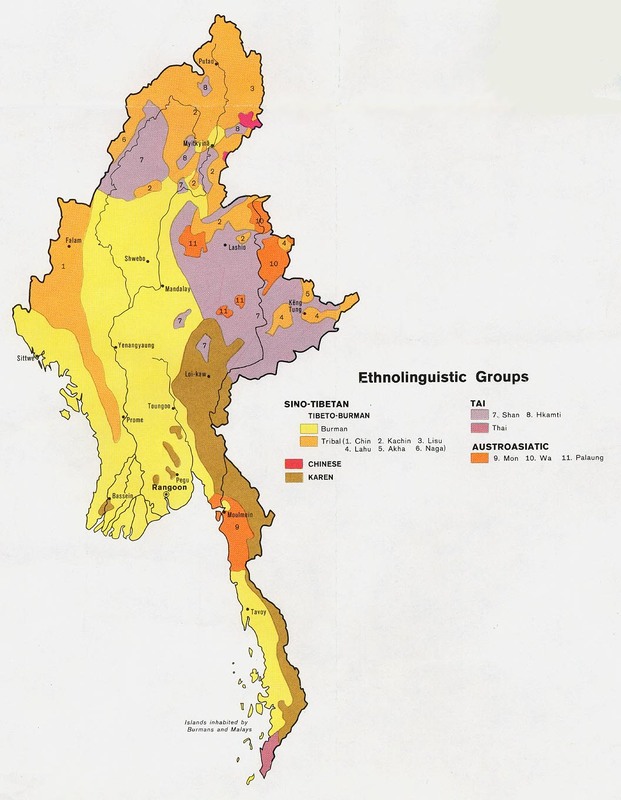 Chin, too, was a derogatory Burmese term used in the past to denote all the various hill tribes living near the Myanmar and India border-a neglected and underdeveloped area. The hill tribes in southern Chin State earn a living by trapping, hunting, and logging. They also practice shifting cultivation. Since dense plant growth limits the use of land for agricultural purposes, they clear the land by burning the vegetation. They then grow dry rice on it for three or four years before moving. Some groups, however, have settled permanently in large clearings in the forests. These forested areas are state lands, but the farmers fight for their claim as landowners. Land tenure in Chin State is a complex matter. Approximately one-quarter of the land has been affected by erosion. Myanmar is one of the world's leading rice producers, but the Mun Chin are able to raise only enough to feed themselves. To supplement their income, the Mun Chin work at seasonal migratory jobs, such as cutting sugarcane or working in factories. Severe labor shortages in the fields often result from these migrations. Mining precious gems, such as jade, rubies, and sapphires, is another way the Mun Chin can help themselves financially. A Mun Chin house usually has only one room. All activities take place on the floor where food is prepared and eaten. Mats are rolled out nightly for sleeping and then rolled up or stacked away during the day. Because the floor is the center of home life, it is grossly impolite to enter a Mun Chin house while wearing shoes. The family often dines outdoors. Political organization in the communities is shaped by the political constitution of Myanmar. From the Prime Minister to the village headman, there is an unbroken line of administrative authority. The community elects a single headman, and then is recorded in the census as a territorial unit for the purpose of assessing taxes. For the commoners, the government is one of the five traditional enemies, along with fire, famine, flood, and plague. Military service is compulsory for both men and women. While most of Myanmar is Buddhist, the Mun Chin practice their own ethnic religion that embraces animistic beliefs. Animism includes the notion that forces and aspects of nature (wind, rivers, trees, earth) are connected with spirits or supernatural beings. These spirits are called upon to help solve the urgent practicalities of life, such as securing food, curing illness, and averting danger. The Mun Chin animistic beliefs include spirits called nats, which are inherently evil. One must spend his life trying to appease them through sacrifices and rituals, so that the less evil spirits will fight off the more evil ones. Farmers may spend more money in a year on their religion than on their family's schooling, health, and clothing. The Mun Chin have many medical problems. Iodine deficiency disorders, such as goiters, are among the priority health problems in Chin State. Christian medical teams are needed to minister to the physical needs of the Mun Chin. Holding to animistic beliefs, the Mun Chin live their lives in fear of displeasing the spirits. These precious people desperately need to know the Truth of the Gospel. * Ask the Lord of the harvest to send forth laborers to work among the Mun Chin. * Ask the Holy Spirit to grant wisdom and favor to missions agencies focusing on the Mun Chin. * Ask God to speed the completion of additional evangelistic materials into the Mun language. * Ask the Lord to bring forth a strong and growing Mun Chin church for the glory of His name!View Chin, Mun in all countries. 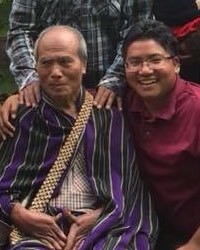 Location in Country: Chin State: Mindat township; Magway region: Saw and Tilin townships.